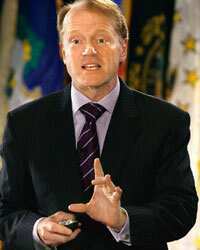 Since January 1995, when he took over as chief executive of Cisco Systems Inc., John Chambers has grown the company’s revenues to $35 billion (Rs1.38 trillion) from just over $1?billion. Cisco’s growth—and longevity—in the fast-changing world of computer networking has been applauded by the Wall Street, with the stock rising 3,000% since 1995. Particularly tough periods in the company’s life have been the dot-com meltdown of 1999-2000 and the tech slowdown earlier this decade after the 9/11 terror attacks. This year, for the first time, Cisco India has topped $1 billion in sales. Which customer segment is leading this—enterprise, services or government? What about the small and medium businesses and consumer segments? What about wireless? Without inferring anything to our current quarter, we are continuing to see some very positive early results of our new globalization strategy, with Wim Elfrink, our chief globalization officer, moving to Bangalore and taking 20 of our executives with him to develop our new service and support model. We believe this should continue to have a very positive benefit throughout the region. We currently have a strong market share in core technologies and advanced technologies, and we are excited about the market potential in our vertical markets. In particular, the enterprise and commercial sectors have done well in India. Wireless is definitely a big opportunity for us. India is one of the fastest growing wireless markets globally. The government is exploring wireless and there is a potential to leapfrog technology in the developing world that is very different from the developed world; it is an exciting market for us. During your last visit to India you announced a $1.1 billion investment road map in the country. Have these funds been deployed? Out of the $1.1 billion investment announced in 2005, Cisco has allocated more than $750 million towards R&D activities, training, and development and expanding relationships with strategic partners in India. Cisco Systems Capital has a $150 million fund to provide leasing and other financial solutions to Cisco customers and partners. We have committed $100 million towards venture capital investments in high-growth, early-stage companies in India. In addition, Cisco continues to expand its customer support operations in India and plans to invest $100 million in growing its technical services capabilities, spare parts depots and channel development. We recently established a 24x7 premium spare depot in Chandigarh. In addition, Cisco has begun contributing products and services for rural connectivity and the development of a Bharat Sanchar Nigam Ltd (BSNL) lab in Chennai and has allocated $10 million towards these efforts. Cisco has also started its IP (Internet protocol) phone manufacturing pilot facility in Chennai with one of its global manufacturing partners, Foxconn. Last time when you were here, you had announced that the headcount would triple in the next three years. (It was 2,800 in the second quarter of 2007). Are you on course to achieving that? Yes, we are on track with our hiring plans in India. We are growing rapidly and attracting great talent in the industry. In addition, as part of our globalization strategy, we expect every function in the organization will have at least 20% of our top talent in Bangalore in two to three years. Are there any plans to expand the manufacturing facility in Chennai? The pilot is still very new, having launched only this past March, and it is too early for us to commit to expanding. We typically start off manufacturing operations very small, through our local partners, giving us an opportunity to maximize learning and to optimise competitiveness. We would like to see some elements of the infrastructure in India develop more fully, however, and to be able to source more components in-country. On the changes within the company—what was the rationale behind appointing Elfrink as Cisco’s chief globalization officer last year? What has been achieved so far? The globalization centre in India enables Cisco to have a strong presence in a region with high growth potential. We have made significant progress in our globalization initiatives, which are already showing early results. The majority of the company’s primary business functions, including sales, finance, human resources, marketing, engineering and customer support, are already being represented in India as well as in the US. Through the Globalization Centre East (in Bangalore), Cisco is creating new ways to deliver information, products and services. Wim is driving our globalization strategy to deliver an enhanced customer experience with a follow-the-sun type of approach. This is all enabled by our Internet-based business model and a suite of collaborative products such as Unified Communications and TelePresence that make the physical location irrelevant. There is great confidence in Wim’s ability to lead both Cisco services and India. Wim is one of Cisco’s most visible and globally respected leaders and he is just one example of the strength of our leadership team and how others will evolve over time to support different areas or functions within the organization. How do you go about developing a second line of leadership? Cisco is trying to achieve what no other company in the high-tech industry has achieved. We have the opportunity to be the global leader in communications and IT, and we can only achieve this position with a leadership team that can execute together. Overall, we focus on hiring the best talent globally. In the area of “acquiring" talent, I have always said that you don’t acquire companies; you acquire the best technology and the best people. India has a strong talent base in engineering—excellent for our global technical resource hub. We plan to continue to develop this talent at every level, especially since 20% of our top talent will be based in India at some point in the near future.